Some call the popularization of zombies in the media a fad. What do you think about shows, films, and games that spotlight the undead? Well, hopefully you don't mind them, as the next game I have for review is full of them! It's Undead Nightmare Storm, and it is available for the Nintendo 3DS eShop right now. Zombies are a recurring thing in media. From movies to television shows, the undead certain have never been more alive in popular culture. This also pours into video games, what, with Resident Evil, Left 4 Dead, Dead Island, and an amalgamation of other titles. Outside of big AAA-developed games, smaller games are in the zombie business as well, such as a new Nintendo 3DS eShop game, Undead Storm Nightmare. Like an overhead Left 4 Dead in how it plays, is Undead Storm Nightmare a dream to play, or something horrid you'll want to quickly wake up from? Undead Storm Nightmare has you playing through multiple missions, each with their own set of stages (generally two or three regular levels and then a special boss level). While the arrangements of obstacles and design of the stages differ, you're hanging out within the same three area types: a decrepit city, a cave with patches of darkness, and a switch-heavy army base. This made me wish for other areas just to bring some visual variety to Nightmare. This protagonist is hardly a damsel in distress. The game does not go very far in establishing any semblance of a plot. The goal is simple: get through the stages infested with zombies, blasting through them while edging closer and closer to the stage's goal. Along the way you earn survival coins from destroyed boxes and clearing a mission that allow you to purchase new weapons and new missions. Yes, there is a level of grinding within Undead Nightmare Storm, as unlocking new missions isn't a process performed by completing the previous mission. Instead, you have to earn enough Survival Coins to outright buy the next mission. This is also how you purchase new weapons, anything from melee weapons to long-range weapons, flamethrowers to chainsaws, mines to grenades. It is also how you upgrade their rate of fire, firepower, reload speed, and capacity. It's an amount of grinding that may put off some players and bring a feeling of ennui at the same time. 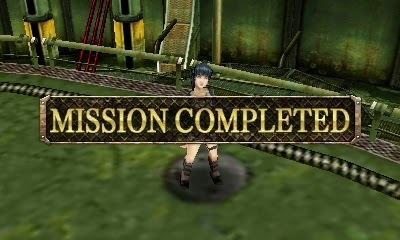 While stages are mindless fun, playing them over and over just to unlock a new weapon or mission can get tiring. The Nightmare part of Undead Storm Nightmare's title refers to a specific enemy that is unlike any other in the game, a female apparition holding up a lantern. If you get in her line of sight, she will call upon the aid of immensely more powerful zombies to quickly take you out. While it's possible to defeat her hellish minions, it is no easy task, especially with your starting equipment. Death comes quick and so does the accompanying Mission Failed screen. Otherwise, there is a great amount of repetition within the gameplay outside of these Nightmare parts. Running and gunning the same batch of four different enemy types through the same three area variants gets tedious through repeated play, which is unfortunate, as the game has other nice qualities to it. Undead Storm Nightmare plays like a twin-stick shooter. However, since the Nintendo 3DS lacks a second Circle Pad and the Circle Pad Pro peripheral is not compatible with the game, you use the Circle Pad to move and the L and R shoulder buttons to turn. L turns your character to the left, while R turns her to the right. Pressing both shoulder buttons at once spins your character 180 degrees. It is a control scheme that takes but a couple stages to learn, and then it becomes second nature quite quickly. Meanwhile, the touch screen is used to switch between weapons, while he face buttons serve as means to shoot and attack, reload, use health packs dropped by enemies and found in crates, and to help out your partner, a multiplayer-only ability. This line for Amiibo ended tragically. Multiplayer is indeed in Undead Storm Nightmare, allowing up to four players locally to shoot and carve up even more enemies than you'd see in solo play. All players need to have their own 3DS equipped with a copy of the game in order to play together. If this setup is manageable, you'll find yourself and your friends having a blast blowing away hordes upon hordes of the undead. In the presentation department, Undead Storm Nightmare won't win any awards on appearance, much less get many comments on how it is a good game to look at. The entire game seems to be coated with unclear visuals and more muddy textures than a motocross track. That said, the frame-rate is solid throughout the game, which is fantastic considering how many zombies can fill the screen at any one time. Nightmare does not have 3D effect to speak of, unfortunately, but perhaps that was to keep the frame-rate from becoming a nightmare itself. One of three bosses concludes each set of stages. Audio-wise, Undead Storm Nightmare presents to players English voice work aside from the playable character when she completes a mission. The music is serviceable enough, offering relatively short loops but never coming across as overly repetitive or grating. Undead Storm Nightmare's gameplay, however, is overly repetitive, and the reason for this is the forced grinding involved to get Survival Coins to purchase new missions to progress in the game, weapons, and materials to upgrade said weapons. If you're looking for a highly affordable and mindless overhead action shooter to pass time and don't mind some redundancy in gameplay, then Undead Storm Nightmare may be a suitable download for you. Review copy provided by G-STYLE.